Hydroelectricity is the generalised term used to describe electricity that has been generated using water, hence the term hydro. However, when we see the term “hydroelectricity” we tend to think of electricity generated by the massive hydroelectric power stations, dams and reservoirs high up in the mountains. These huge vertical concrete walls (up to 200m in height) hold the potential energy contained within a large body of water behind these tall concrete structures extracting the energy from the moving water once it has been released downhill converting this energy into mechanical energy by means of a hydro turbine. When stationary, the water within the reservoir is regarded as stored or potential energy but once released and flows under the influence of gravity this stored energy is converted into kinetic energy by the movement of the water and large hydro turbines convert this movement into electrical energy that can then be distributed and sent along power cables to thousands, and even millions of homes. Then using the power of moving water to generate electricity is commonly referred to as hydroelectricity. But hydroelectricity generation can also be on a much smaller scale and today people are finding new ways to create locally sourced hydroelectric power with small scale hydro power projects being designed to be run-in-river as it does not affect the flow of the river significantly. Small scale hydroelectric power schemes can be replacements for costly diesel generators for rural electrification serving whole rural communities with both light and power. Traditionally small scale hydro power generation was achieved by redirecting the flow of water through waterwheels and other such mechanical devices to spin electricity generating turbines. As a result, over the years there has been many improvements to both the waterwheels that convert the falling water into a rotational movement and in the electrical generators themselves ranging in size from a few 100 watts up to hundreds of kilowatts. Also small dams and weirs have been created and used to store the water at higher elevations in an attempt to increase the power potential of a site enabling even more production of electricity using the seasonal variations in rain fall. Run-of-river Hydroelectricity which uses the kinetic energy contained within the natural flow of a river or large creek to generate electricity. Generally run-of-river power generation systems do not have any form of water storage capacity as they operate directly within the river which means it is unable to generate enough electricity to match consumer demand. Thus generating more power when seasonal rainfall and river flows are higher, and less during the drier summer months. High-head Hydroelectricity the water is dammed up and stored in a reservoir behind a high concrete dam to be used when required. The production of electrical power is through the use of the gravitational force of the falling or flowing water through the hydro turbines. Reservoir type power stations are easily able to meet peak load demands and as such is the most widely used form of renewable energy. Pumped Storage Hydroelectricity is another type of reservoir power generation in which two reservoirs are used to store the energy in the water. During low cost off-peak hours, reversible turbine/generator assemblies can act as both pump and turbine pump water from a lower elevation reservoir up to a high elevation reservoir for storage. 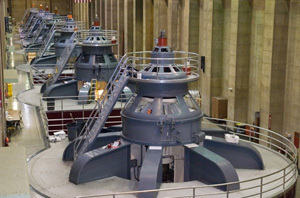 During the day or periods of high electrical demand, the stored water in the upper reservoir is released through the turbines to the lower reservoir. Then pumped hydro storage converts cheaper night time surplus electricity or even wind turbine produced electricity into peak load electricity. Hydroelectricity generation is the most widely used form of renewable energy today, and for many people the construction of dams and reservoirs to produce cheap and clean hydroelectricity has been a blessing, as hydroelectricity is a non-polluting source of electricity because no harmful emissions are released into the atmosphere since no fossil fuels are burned during the production of electrical energy. But for some, they have been affected by the loss of land, whole villages and the destruction of old traditional ways of life. Some even argue that hydroelectricity production is not sustainable in the long term due to environmental and aesthetic reasons, as what was once a beautiful valley has now been covered with water when the dam was built. Also they argue that many hydroelectric dams prevent fish from returning to their native spawning grounds or may be killed in the turbines when the water is released. Even so, large hydroelectric projects can be found in many developing countries around the world. China for example, has built the massive and controversial Three Gorges Dam Project on the Yangtze River. This dam and reservoir is reported to be the largest hydroelectric project in the world in which more than one million people had to be relocated before the dam’s reservoirs could be fully flooded. Today renewable energy technologies form a major part of our both our lives and energy requirements. But most forms of renewable energy are unreliable as the sun does not shine or the wind does not blow all of the time making other renewable and alternative energies both intermittent and unpredictable. However, hydroelectricity is fairly uniform in its power generating capability and can be easily scaled up by making the dam higher. For example, all things being equal, doubling the height of a dam, increases the water storage by eight times and the electrical power potential by sixteen times. Also hydroelectric energy is stored energy ready to be used until the water is released where as the cost storing other forms of renewable energies can be significant. Hydroelectric is a well established technology capable of producing power 24 hours a day. One of the major advantages of hydroelectricity and of hydroelectric power is that like the power provided by the old style waterwheels, no fossil fuels are burned to release greenhouse gases (such as carbon dioxide and sulphur dioxide) into the atmosphere, where they can produce smog and contribute to global warming and acid rain. Also, no chemicals are used in the production of hydroelectricity that would otherwise be disposed of in the environment. Hydroelectricity generation is also free in that the fuel it uses to generate the electricity, the water, does not have to be produced, dug up or purchased as mother nature provides it in the form of rain and snow. Naturally money has been spent building and maintaining the dam and hydroelectric power plant. There are also secondary benefits to hydroelectric dams. They can provide flood control for rivers protection towns and fields downstream. Plus the large expanse of water within the reservoirs allow for recreational activities such as swimming and boating. However the future is never certain and hydroelectric power still faces many obstacles. The main disadvantage of hydroelectricity generation is that while there are many good solar energy sites for solar panels, there are less good wind turbine sites, and very few good sites for hydroelectricity production. But hydroelectric power generation will continue to grow especially with small scale hydro schemes as long as there is water flowing in the rivers. Dams are very big but the problems of flooding land is better than no water for the people. Dams can give drinking water and electricity to many people in big cities.